The Country House looks very different than it did a year ago. There are beautifully painted walls, shiny flooring, and plush-though-hard-to-keep-clean carpet. There’s no clutter–mostly because we want to live that way, but also partly because we can’t have personal items on display while the house is on the market. I didn’t think it was possible that we’d post here less frequently in the second half of the year than in the first six months, but I’m sorry to note that we have. It’s not from lack of interest, or lack of stories to tell, and certainly not from lack of good food. It’s just been awfully busy. Shows and meetings and rehearsals and late work nights followed by early work mornings, and, of course, preparations for our wedding. Even a simple, small wedding takes plenty of preparation. 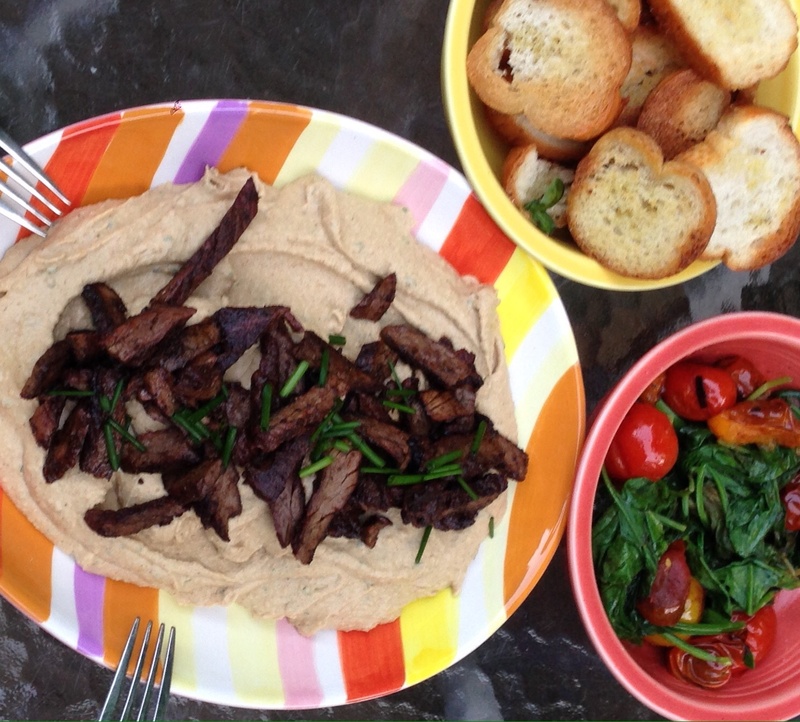 Skirt-steak and hummus, the first time around. It’s been a year since that first overcooked burger, a year since she fell asleep on the couch the movers just delivered. Well, it hasn’t been a year since she fell asleep on the couch; that still happens now and again. Burgers get overcooked from time to time, too, but she doesn’t seem to mind. Romance isn’t gone. Good cooking isn’t abandoned. We do what we can with the supplies we have, with the time we have, with the energy we have. We took a break from commuting and rented an apartment in New York during my busiest month. It was the home of an acquaintance of mine, a composer and music director who was working out of town and visiting his family. That temporary City House was nowhere near as lovely as her former apartment–and certainly not as beautiful as the suburbs were on weekends. Sadly, it wasn’t even as convenient as we hoped it would be. It’s giving us reason to think maybe we shouldn’t move after all. Even if we do, we’ll still update this journal, at least from time to time. Even if we don’t have a Country House, we’ll still have Dinner.